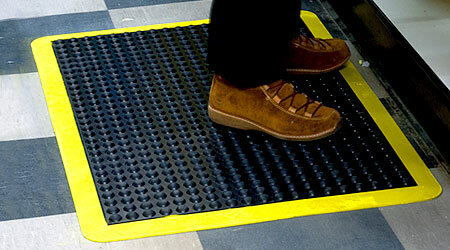 Welcome to SafetyGear, specialist’s in Quality Rubber Flooring and providing a diverse range of safety, anti-fatigue, ergonomic and entrance matting solutions. RoadGear Australasia P/L has been a market leader in rubber matting for over 20 years, and one of the largest importers of rubber matting in Australia, specialising in a diverse range of automotive rubber mats to O.E.M., major retailers and distributors, and also exporting to the Pacific region. SafetyGear (A Division of RoadGear Australasia P/L) has been established since 2004 focusing and specialising solely on our growing safety, anti-fatigue, ergonomic and entrance flooring markets. Today, SafetyGear, in partnership with our key suppliers, is at the forefront of the industry. Our company is a highly respected and experienced supplier holding AS/NZS ISO 9001:2000 quality accreditation, and providing national product distribution throughout Australasia. Our company is committed to the pursuit of quality and service excellence, and we proudly state all our matting products are free of prohibitive "Substances of Concern". SafetyGear’s name is synonymous with Superior Quality and we are proud to maintain our position as supplier of premium quality floor protection catering for the Safety, Industrial, Manufacturing, Food Service, Janitorial and Retail sectors of the Australasian market. At SafetyGear, we believe in high standards of product quality, consistency, flexibility and service excellence. We also believe in building partnerships and rewarding our customers for the precious business they provide us. Being a family run business, you as a valued customer are a “partner” of SafetyGear, and will experience our personal, professional and dedicated attention whilst at the same time gaining confidence in the expertise and World Class quality of the products produced by our suppliers who are in turn “our partners”. This said, we constantly seek to bring you our valued customers efficiency and productivity through “Continuous Improvement” to process, automation, mechanisation and innovation. Our most valuable asset is our people. Behind SafetyGear is a lean organisation with an empowered team of highly experienced management and staff, working together with our manufacturing partners, incorporating project engineers, process control engineers, technologists, R & D personnel, rubber specialists and marketers to provide you with the very best quality products and pricing, combined with superior delivery and after sales service. Together, we continuously strive to give you the very best solutions to your requirements and build your confidence in SafetyGear. Product development and innovation is our ongoing goal and to this end, we work very closely with you our valuable customers developing new products to meet the ever changing needs of your workplace and market demands. 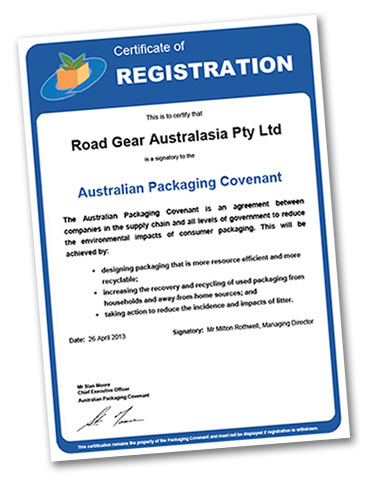 Road Gear Australasia is proud to be a signatory to the Australian Packaging Covenant and is committed to reducing the environmental impacts of consumer packaging. To see our current Action Plan click here.